So here are a couple of images taken of a few interesting things in the Los Angeles Fashion District. They are of a double-needle overlock (serger) kind of machine – or at least what appears to be, a miscellaneous (what appears to be probably a walking foot machine, although the walking feet are not there) extra heavy duty machine for extra super thick materials, and a view of Bega’s (only about half of it, probably only a third really). The Taiko, was peculiar only because of it’s cool green graphics, but after looking at it for a few minutes it became clear that this was no everyday machine. 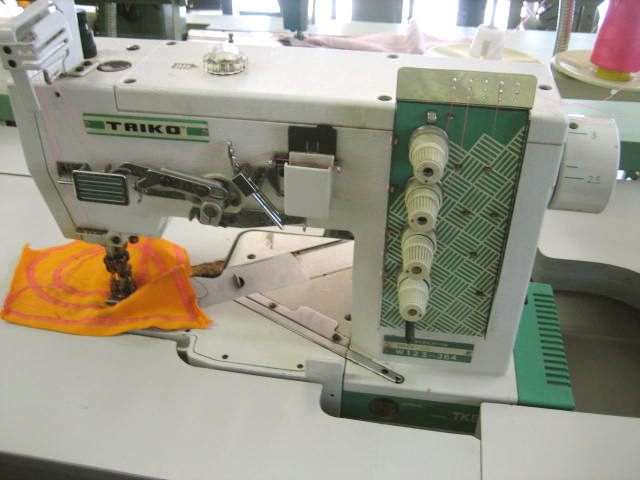 It is hard to say what exactly it is for, but as you can see in the picture it is a double needle machine, it does not use a bobbin(s) but instead relies on a similar thread feeding system to the conventional serger, and lastly it has a very unique bed with two diagonally opposed sliding mechanisms. The next picture is incredibly thick materials which have been sewn together by who-knows-what. The part that is mystifying is that it has the small loop section on the presser foot, which does not seem to tell us that it is a directional foot. As in – it is probably some kind of tacking system. So what that means is that it has a round (presser) foot, or hoop style because it has a programmed or pre-set range of motions to make a particular type of stitching pattern. Like a bar-tacker does an across and then zig-zag stitch, back over the first large stitch. 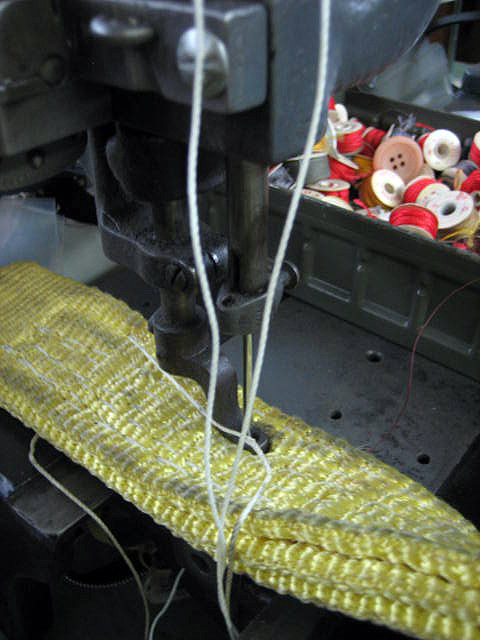 It was hard to tell however what the pattern of the stitch was on the yellow material. it could be assumed that it was a rectangular pattern with some kind of diagonal crossing in the middle of it, much like you may see on hiking gear – where there is a common square with an X to re-inforce areas that will see extra stress. Although there should still be two small feet ont he side that are generally used to hold the fabric steady, with the mechanism below as the driving force for the given pattern. The last picture is of Bega’s. It was taken from the front of the shop as you are walking in, and then looking a bit south and east. 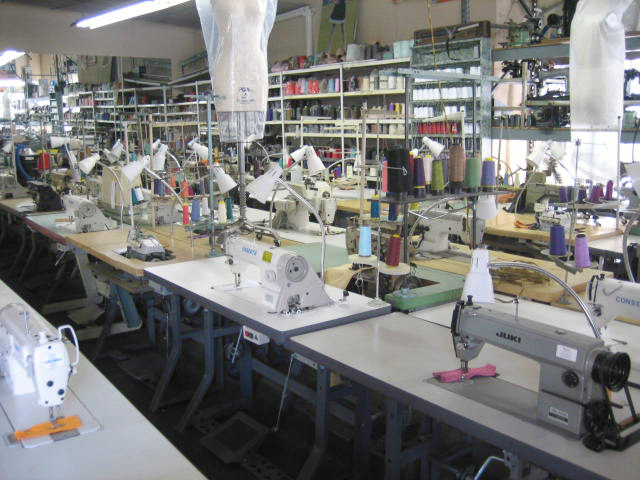 Just to give you an idea of how much industrial sewing is going on in that area of the country, this is only about a third of Bega’s – and Bega’s is only one in very very many industrial sewing dealers in the Los Angeles fashion district. A truly fun way to spend the afternoon.